Position key weapons in keyhole positions. Read that one in a US Marines Corps field manual and can't remember which one. Key weapons are usually automatic/heavy weapons and keyhole positions are ones with narrow and deep sectors of fire. A keyhole position is difficult to target simultaneously by a whole group of enemies. The enemy bounding group falls in the keyhole's field of fire and the over-watch group can't target the keyhole position. This is a short story. It's not about US Marines and the key weapon is not a SAW but an XM8 kited with a longer barrel and two 100 rounds drums (the so-called automatic XM8). Not too different than the XM8 carbine I have in the role of group coordinator. Gah! Life at 5.56 mm! We are a 6 men group of contractors carrying XM8s, one FN FAL and one M4. With its 7.62 mm rounds, I would have preferred the FAL as the key weapon, but the rate of fire and ammo loadout of the automatic XM8 won the bet this time. My group is the quick reaction force/counterattack team of a small convoy transporting a VIP through insurgent territory. One of the most famous convoy drills practiced by private security companies is to block intersections with one vehicle while the main body of the convoy zooms by. Today something went awfully wrong after a vehicle covering the intersection got fired upon by insurgents. The rest of the convoy didn't stop, and everybody expected the engaged vehicle to swiftly pull out of the kill zone. The convoy coordinator watched from the back of his speeding vehicle, horrified at the density of tracers zooming through the stationary vehicle left behind. Gator (our call sign), where the &#! @ are you! We have our own problems. We trail a bit behind trying to keep gun tubes on a suspicious vehicle that follows us and doesn't neither approach us nor let us out of their sight. Before the radio call I had to fight the temptation to turn around and shoot the hell out of it. Our level of alert is high, but our security is lousily focused at those guys in our rear mirrors. Our driver is pretty much the only one doing his job right. He leans forward, as if trying to get t into focus the dim shapes of the firefight ahead. $#!+, did you see that? Our SUV speeds forward towards the troubled vehicle. I pull the kevlar blanket from my door and throw it to the rear seats. Never let armor mask your fields of fire. We are about one kilometer, behind. We really messed up this one! Panoramic view of the shoot out, or what is left of it. We (quick reaction force, to the right in the foreground) have arrived to the scene. A badly mauled SUV is in the intersection. There is one KIA contractor on the opposite side of the vehicle and another up the street. It looks like the contractor in the background was dragged and left there. The enemy fire has certainly come from the street that goes towards the background. Stay tuned, more is coming soon. This reminds me of a Tactical Decision Game. Can't wait for more. 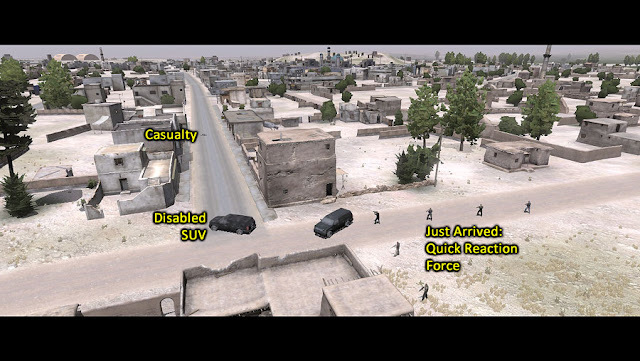 Once again, I reach the same conclusion: it's lots of fun to read your ARMA 2 vignettes, than playing the actual game. I get all worked up after reading these great AARs and fire the game up, only to end up with that "meh" feeling for the umpteenth time. One question: can you change the loadout of your units/elements in the editor? Is you can, how do you do it? Those TDGs were great. I wish I could make the blog entries as interesting as those! I am sure you can change the weapons loads of each character. I've done it in JCOVE Lite but I can't remember how. I will get back to you later with this.